For months, Detroiters have been wondering what’s going to happen with the massive piles of filthy petroleum coke that have been polluting the city’s west side. Aside from the fact that the wind has blown it into apartment buildings and nearby businesses, interests of the Koch brothers, which unsurprisingly own the pet coke, don’t seem in much of a rush to move or get rid of it. Thanks to Mayor Dave Bing, that should all be about to change, now that he has issued a second removal ordinance. 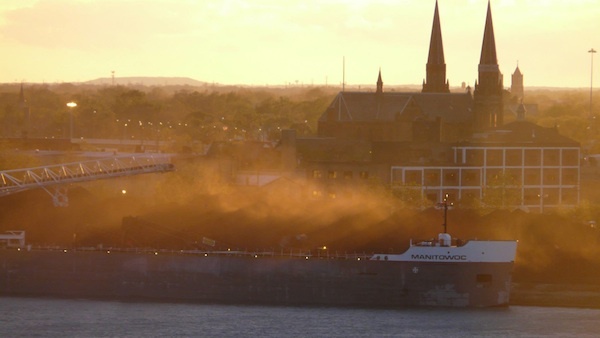 “Today, my administration informed Detroit Bulk Storage that all of the stored petroleum coke material must be moved off site by August 27,” he said. “DBS personnel have assured us that no new materials are being brought onto the site, and all of their activity is concentrated on offsite removal of the pet coke. The coke is a result of a local refinery that began processing Canadian tar-sands oil in November. It can be burned for fuel, but doing so actually violates American clean air laws, so the company has been trying to get rid of it somewhere else. According to Koch Carbon, the piles will soon be moved to Ohio. I’m guessing they’re going to keep moving south until it just falls into the ocean. Out of sight, out of mind? We may finally have it out of Detroit soon enough, but that doesn’t mean it’s no longer a problem.